Ah, the first day of a new set. The virtual sound of packs being ripped fills the Æther, the casual draft room gets an airing, and several fools are soon parted with their money as they eagerly lap up the new tech as soon as possible. I am one of those fools, although the new cards I'm after are of a different ilk from the Pact of Negation or Glittering Wishes sought by the tournament crowd. With each new set, I make it my aim and intention to build, play and win with at least one newly-legal tribe. With Future Sight, we get two brand new faces on the tribal scene and a couple of Standard tribes lose their reliance on Mistform Ultimus. Let's see how well they fare. We're not hobbits or halflings, honest! Your aim is to get an evasive ceature out nice and early, preferably a Skulk, and give it a few tools with which to smash face. Should the game go long, you can generate as many tappers as you need, else use Gaze of Justice to remove problem creatures. 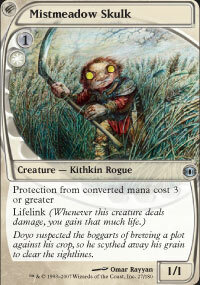 Between tokens and rebel Kithkin, you should have no problem reaching 3 creatures in play. Weaknesses include wrath effects: Interestingly, while Pyroclasm or (Rough) will give your creatures a hard time, Kindle the Carnage, Flamebreak, Pyrohemia or similarily costed cards can't touch your Skulks. This deck has surprised me with how effective it can be, and with only Ultimus as a required rare (feel free to substitute the fixing of your choice for the Adarkar Wastes: I'd run Hallowed Fountain if I had them, but there are plenty of cheaper options), affordable too. 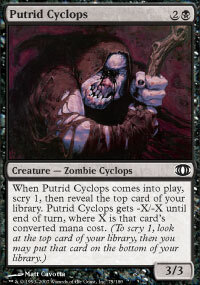 This is a tribe which should have been legal a long time ago: the intermittent creature type policy revoked Cyclops as a tribe during the first purge of types, lumping it in with Giant, then reinstated it when Borborygmos started his erudite 'Crush them!' 'We eat!' routine in Guildpact. 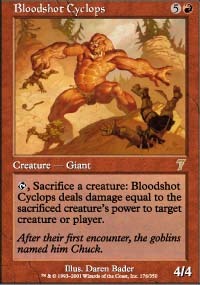 Guildpact was released between Mirage and Visions online, those two old sets being replete with the one-eyed guys, and the new precedent set meant that the Cyclops of 8th Edition were split between the two tribes, as Hulking Cyclops was updated in the Visions release. 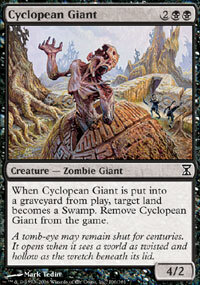 This leaves Bloodshot Cyclops and Ekundu Cyclops sitting on the sidelines with the ambiguously named Cyclopean Giant. Drawbacks aplenty, but there are two things which stand out: the power-to-cost ratio here is superb, and every tribe member can survive a Pyroclasm without flinching. 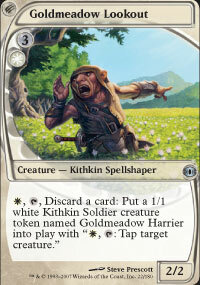 Let's see what we can do about the drawbacks: We need a good number of spells costing less than three to supplement our lands as ways to keep the Putrid alive, mass untargetability would help the Tar Pit and sweeper effects as mentioned earlier help in terms of preventing chump blockers. We need to touch upon 4 colors to be able to play everything, and that, coupled with the need for less than three mana, means we're going to need to do some interesting things with our mana base. I've decided to showcase two versions: One using dual lands and the other, common and uncommon colourless fetches. prone to being their own worst enemy. 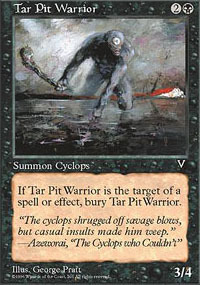 On the strength side there aren't many tribes that can go toe to toe with an early cyclops assault, and many find themselves washed away in flames as your guys rumble past. A fun little deck, slightly whimsical in nature in its choice of support cards, with all of them originating in earlier sets. 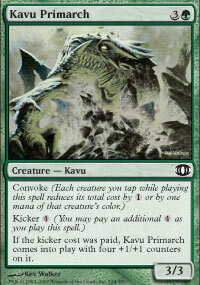 The Kavu themselves are a potent bunch, with your early drops attacking for a decent amount and your bigger guys generating card advantage. 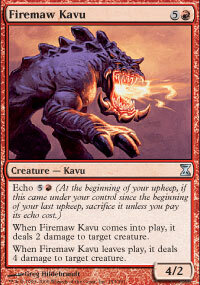 Fiery Justice and Kavu Predator is a fairly obvious trick, but wiping out just shy of a half-dozen 1-toughness creatures and swinging for 7 is just plain fun. If you're stalling, the Kicker on the Primarch is fairly easy to attain. The main weakness of the deck? Fliers. 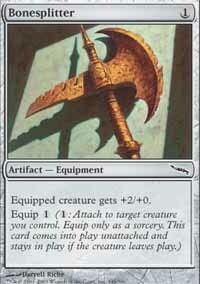 Aside from your removal, evasion will be a significant concern. Given that the deck is for standard tribal, there are a fair few more focused decks which you may end up against, not to mention the extremely high likelihood of Slivers. Another Tribal Standard deck, this one: Again, celebrating its freedom from the clutches of Ultimus with one new tribe member. 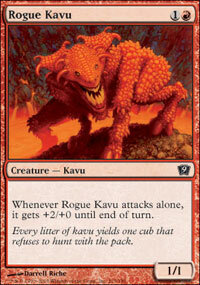 In this case, a tribe member that fills in a much-needed spot on the curve, providing a play before turn 5. In this case, the tribe tops out at 8 mana, hitting every mana cost descending from that once, including 4 for ultimus and 3 for the new kid morphed. 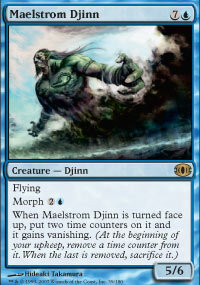 And an interesting new kid it is, Maelstrom Djinn. 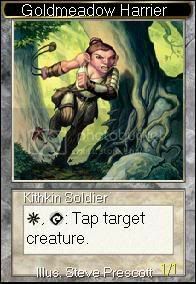 Hardcast, he's an expensive Fat Moti, turned face up and the card he most resembles is Vexing Sphinx: Both hit play for 3 mana, both get two solid evasive hits in before the number of counters on them sends them to the yard. 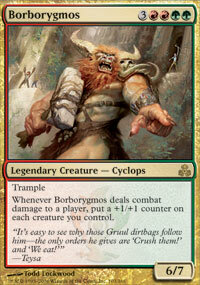 Our objective here is to use our cheap removal and draw to enable us to survive to cast the big guys. The mana costs on the support spells are low so as to take advantage of Djinn Illuminatus' ability and Tidespout Tyrant's trigger. The weakness of the deck is the early game: If you can't slow your opponent's advance you may be in trouble. 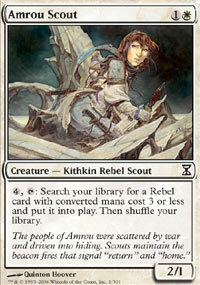 On the plus side, the deck can go toe to toe with flyer heavy threats such as Angel or Illusion. That just about wraps it up for this time. Looking at the various cards in future sight, there are plenty of interesting options to look forward to: Wraith, Ouphe and Kor are only one step away from Tribal legitimacy. On the Standard front, two more Efreeti will bring that tribe out of Classic, so keep your eyes peeled as Xth is revealed. Looking towards the more obscure side, there's an off-colour tribe and a double-qualified tribe I intend to purchase between now and my next article. Until next time, may the new set provide the missing piece to your tribal puzzle. 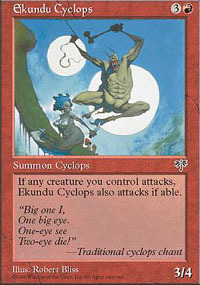 As an aside, I find it amusing that the PureMTGO card graphics display Ekundu Cyclops as a Cyclops and Hulking Cyclops as a Giant. One of the clearest advantages of the online over the paper game is the cards of whatever version always being up to date with the latest errata. Ah, the Visions ones were. Sorry, I missed that line. 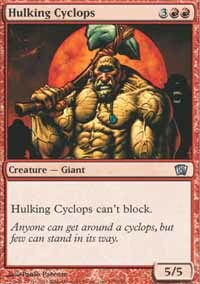 Constant quality is one of your best points, and I liked to lose versus the cyclops one, even when I was pretty short on mana. 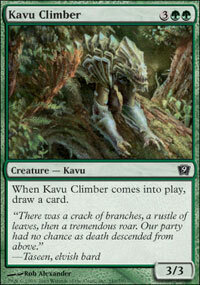 Kavus.. well, I was going to build that one myself as soon as possible Flying blue fat is always apealing, too. .